Conditions were not expected to be so ideal until I checked the models early on the same morning. 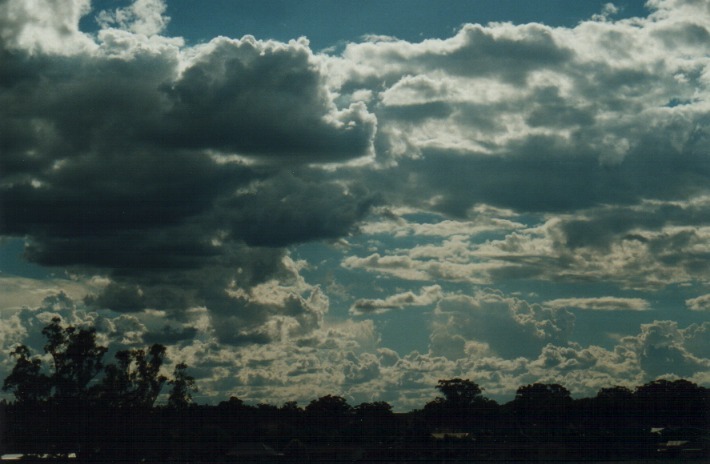 The surface lifted index was indicating some major activity just to the northwest of Sydney with the best conditions around Mudge area and further west although the air was drier on the surface. A cold pool of upper air had passed over the northwest of the state and was expected to head towards the coast (temperatures at 500hPa were -14 to -16C). This had a lot to do with the predicted lower lifted index values (-4 to -6 in areas around Mudge and the Central West). For the best wind profiles, the upper Hunter and North West Slopes and Plains north of Mudgee was under a jet and reasonable profile nevertheless. 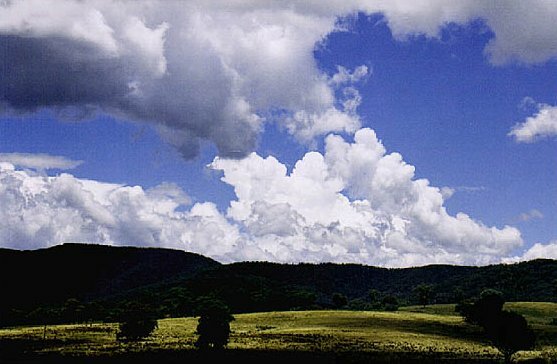 The most ideal moisture profile was the area south of Mudgee. My plan was to chase the area Mudgee but first head onto the Gulgong lookout which has spectacular 360 degree views. The other problem was to have a chaser come along!!! Why? Well because the models weren't predicting such ideal storm conditions the night before. All the chasers must have awoken, checked their e-mails with a shock!! Fortunately I was able to get hold of Daniel Weatherhead. I picked Daniel up around 10:30am and we arrived at Gulgong around 1:30pm. On the way, we were impressed with what we saw. 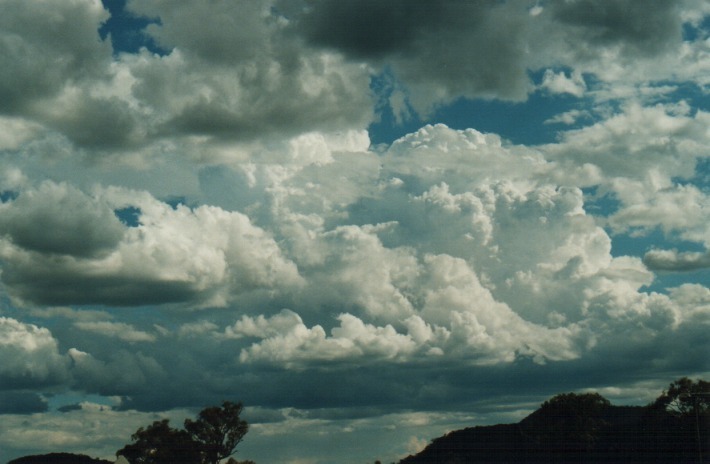 Cumulus congestus were everywhere indicating no shortage of moisture. 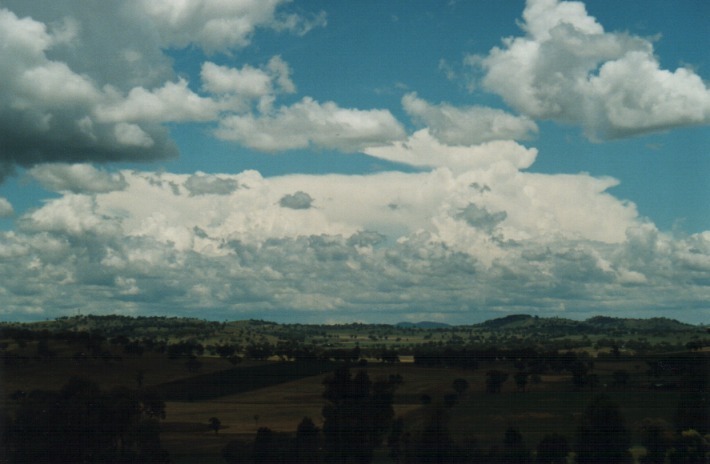 As we neared Mudgee about 1pm, we noticed an anvil to the general south. We stopped just outside Mudgee to get some pictures and also some video footage. The cell was crisp obviously due to the cold upper air. I was also impressed by the separation from the base to the cloud tops. This is the best indication of hail potential visually. This was also in the region where the air was expected to be driest in the middle layers. To the north, we could see the edge of the jet indicated by a band of higher level cloud. It seemed to be the area south and south east of Mudgee continued to fire as we parked ourselves at Gulgong. More cells were developing to the west of these cells but were not able to break the cap. After a phone call from James Harris, we found out there was trough line right near the area of the thunderstorms. This was providng the trigger mechanism. The trough was very unusual: directed southwest to northeast. Storms were expected to begin firing from 2pm but these isolated cells had begun firing well before noon. James also suggested that there was red on radar at Wisemans Ferry. I had got my bearings totally wrong: I simply have to purchase a compass!! After getting a snack to eat, we returned to the lookout and waited. More cells kept developing on the northwestern and western side of the storms but the other two major cells remained quite active. 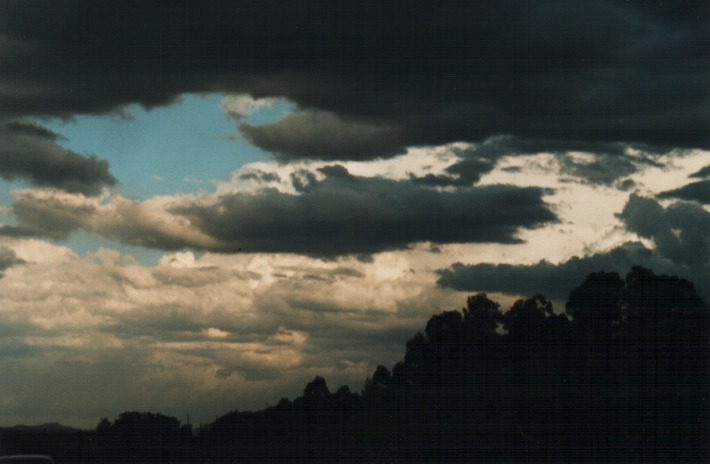 Finally, dark cloud bases developed to our southwest. 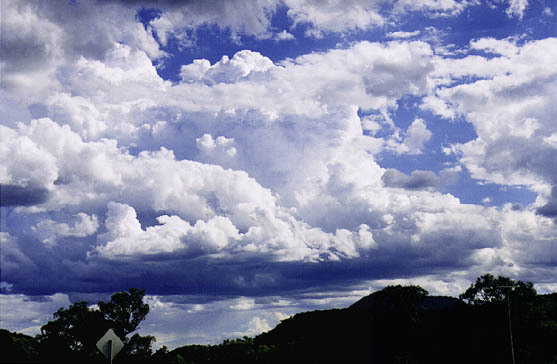 This eventually glaciated aloft and sent larger raindroplets. The droplets were very cold: an indication just how cold the air was in the middle layers. We decided to chase this developing cell towards the coast hopefully picking up moisture. 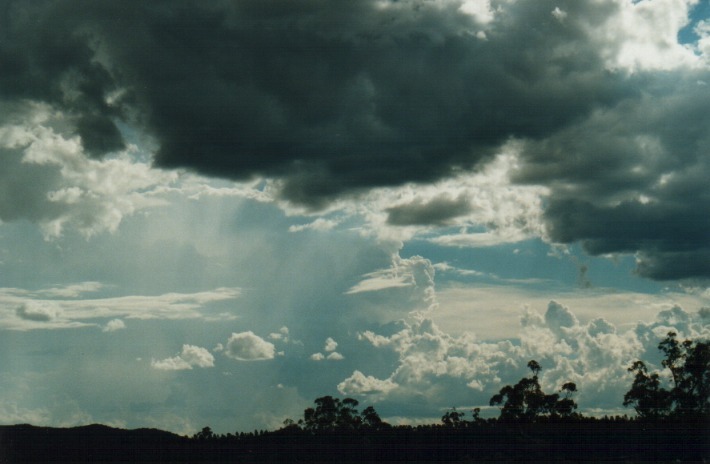 It was quite evident that moisture was drying out near Gulgong as the winds had turned from the southwest. 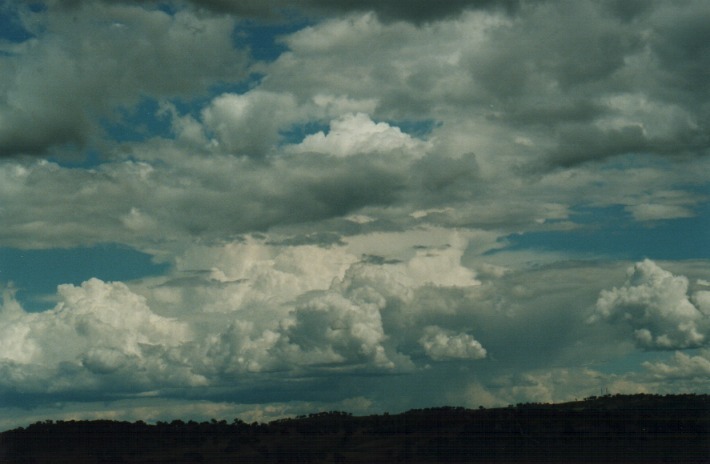 As we took the road towards Merriwa, this cell had become a dwarf cell again but persisted. Other cells to the west were firing but still the main activity was occurring near the original cells. These cells were moving rapidly towards the coast but more were continuously developing to their west and northwest. As we neared Denman, a nice crisp large cumulus or cumulonimbus calvus cloud came into view. We just had to stop and take pictures. We headed towards Denman arriving at about 5:30pm. This cell seemed to have lost its magnificent features. We could see cells developing to our general east and north. We were called with verification of cells approaching Maitland with echos in the red (indicating hail). Since this was too far, we decided to head towards Muswellbrook to chase a local cell with a darkening base. This was part of the system as the nice crisp cell we had observed earlier. From here on, we seemed to be in a maze. For the majority of the trip, I was on the mobile with someone getting updates of the Maitland storm. On radar, it seemed to be a supercell but besides the precipitation cascade, we weren't at this stage able to verify this. 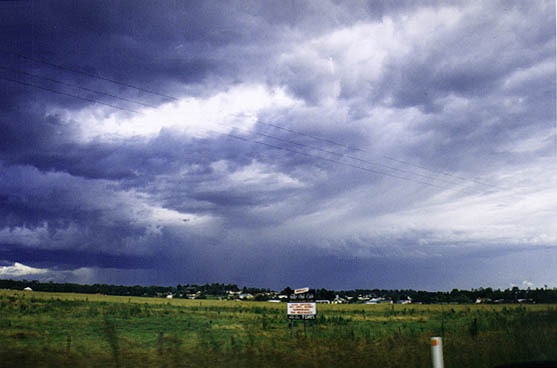 The cell we were chasing precipitated as we travelled along the Muswellbrook by-pass. It was developing a nice rain free base structure and also a crisp anvil was evident. 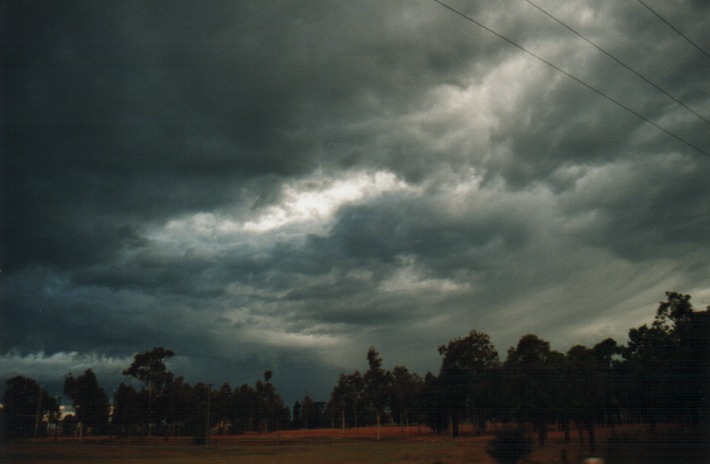 It was heading for the hilly areas just west of Singleton. Now with more and more updates came through about the enormous size of the hail region of the supercell. We could now see the main cell hidden amongst other cells southwest or west of it. I thought it was worth a try to get close to observe some of the structure. And it was the right move too!! The more we approached Maitland, we were able to observe a large band associated with the flanking line, cold outflow on the southern end with scud condensing. We could also see backshearing from a cell off the coast from the earlier storms as well as a nice overshoot or thick side anvil associated with the supercell. It was clearly much larger than the surrounding cells. 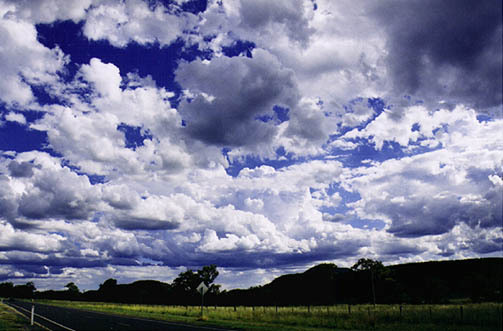 I believe due to the cold atmosphere that large quantities of hail and heavy rain was falling from the storms. 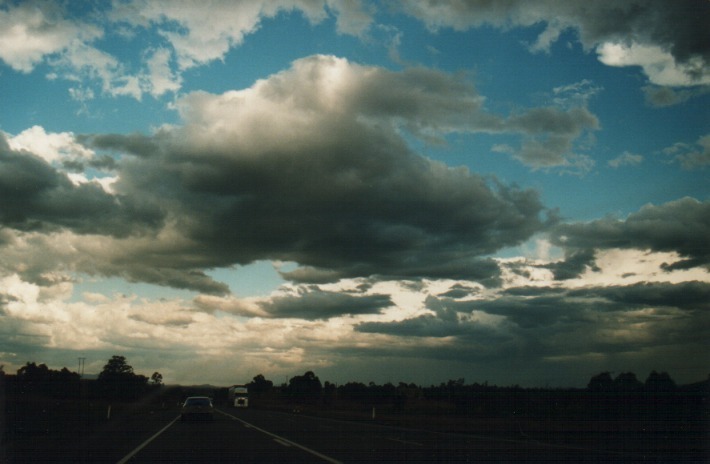 We decided once we approached the Maitland that we would head back towards Sydney. The main reason was due to another major cell towards the south. 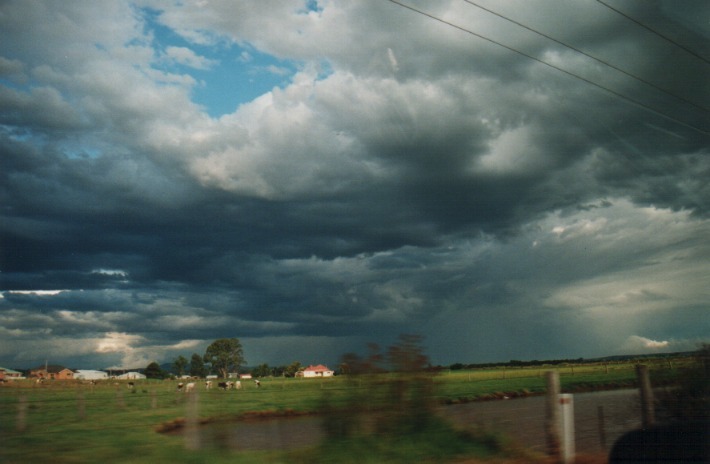 This cell had looked impressive for the time we travelled from Singleton to Maitland but weakened as we headed south. All in all it was a fairly successful day but moisture was a problem in our target area. One thing I had noticed was that the jet was dipping towards the Newcastle area. As the storm entered the jet region, they intensified. This is also the reason why the supercell developed near this particular region. I suspect that it was also the right exit region of the jet. One point I might comment on briefly was that the radar was suspected to have been exaggerating with the whole storm complex showing high reflectivity. I cannot speculate on this but I believe for the time we had observed the storm complex, it wasn't exaggerated. The flanking line was building up rapidly and would have dropped smaller hail. The largest hail would have been in the larger core area of the supercell storm. As I mentioned earlier, the surrounding cells would also have dropped hail of smaller size. I would like to take this opportunity to thank all those who gave updates on this chase. There are too many to thank by name - particularly in the last leg of the chase. We were swamped with phone calls. Definitely, without those updates I was content on not chasing the supercell and chasing another storm nearby. A special thanks to Daniel Weatherhead for coming along on the chase and offering to take video and photographs.